הנכר [PUT AWAY] THE STRANGE [GODS] —which you have in your possession from the spoil of Shechem. ותטהרו AND PURIFY YOURSELVES of idol-worship. והחליפו שמלותיכם AND CHANGE YOUR GARMENTS — lest you have in your possession a vestment that has been employed in idolatrous worship (Genesis Rabbah 81:3). There are three parts to what God is calling upon His people to do, (i) to remove the gods they have acquired, (ii) to purify themselves of idol worship, and (iii) to change their garments as symbolic of that cleansing due to the idea our garments have been defiled as having touched the idolatrous worship and or being used in the idolatrous practice. Note how in the book of Revelation, righteous works is paralleled to the garments / cloths that we wear. This is a significant point Rashi is drawing out about the Lord God calling His people to do. They were not just to remove the foreign gods, but to also turn from that way of thinking, acting and behaving. This draws back in the idea of idolatrous worship in the sense of creating an idol in our hearts. The prophet Ezekiel speaks about this in Ezekiel 14. Based upon what the Lord is saying to Ezekiel, the idol that one sets up in his heart is related to sin (iniquity). This is consistent with David’s words in his psalm saying in Tehillim / Psalms 66:18 If I regard wickedness in my heart, The Lord will not hear; (NASB, אָוֶן אִם-רָאִיתִי בְלִבִּי לֹא יִשְׁמַע) David says the Lord will not hear us due to sin and Ezekiel speaks of the Lord answering such a person only in the sense that is related to the multitude of their idols (sins) that have been set up in the heart. The concept here is “how can the Lord hear if we keep iniquity in our hearts?” Is it possible to desire the Lord to secretly allow (something considered immoral, illegal, wrong, or harmful) to occur, rebellious sin, and accept us while willfully cling to an evil way? The thing that hinders our prayers is iniquity that is harbored in our hearts. Can we listen to idols (evil spirits, or the Evil One) and expect the Lord God to listen to us in prayer? If a person refuses to listen (hear) God’s commands, he will surely refuse to hear our prayers. “Can the Lord God accept our devotions while we delight in sin?” All of these things are very important questions, and are directly related to what the Lord God is instructing Jacob before moving to Bethel. These things are all very important because it is related to the idols we set up in our hearts and listening or hearing the Lord, and obeying His word. Notice how this is connected back to the nature of reality as we had discussed earlier, how one relies upon one’s presuppositions and how this effects ones beliefs and faith? A faulty presupposition have lead to centuries of controversial philosophical judgments and assumptions as it is related to biblical interpretation. We know historically, this has led to all sorts of doctrines that have lead many astray, especially in light of todays liberal theologies being taught in churches such as those who accept hyper-grace theology and those theologies that lead to the acceptance (approval) of LGBT lifestyles and practices. In this case, we can see how the underlying presupposition and philosophical assumptions are leading some people straight to hell because this way of thinking controls how Scripture interacts with life and interferes with the application of God’s Word in life that is effectual for salvation. We need to be aware of this in order to understand what God wants from us as this is related to being faithful to the Living God in Heaven, and being faithful to His Word. While studying the Jewish commentaries, there is a very interesting concept that is drawn out related to “all translation is interpretation.” This is important because it is directly related to this concept of holding fast to a presupposition and philosophical belief that goes into a translation rendering the translation nothing more than a commentary. Let’s look at a few of these references from the Jewish literature. were brought forth, or ever thou hadst formed the earth and the world” ;The translation in the Revised Version might be consulted, in order to see how the Midrashic point of view, based on a literal translation…, agrees with or differs from the ordinary interpretation. While studying the Jewish commentaries, there is a very interesting concept that is drawn out related to the idea that “all translation is interpretation.” Some of the commentaries say “this translation fits the interpretation here than more traditional rendering,” or “this translation follows the interpretation of the midrash,” etc. This is an important observation because it is directly related to this concept of holding fast to a presupposition and philosophical belief (a particular interpretation) that goes into the translation causing the translation to become a commentary. What we find is there are many more references in the Jewish literature concerning the topic “the translation follows the interpretation…” The rabbis are not shy about explaining how a translation follows a particular interpretation of the Scripture. This is a very important observation because it is related to how we are to understand what is going on in the biblical text. (Concerning what is actually being taught.) 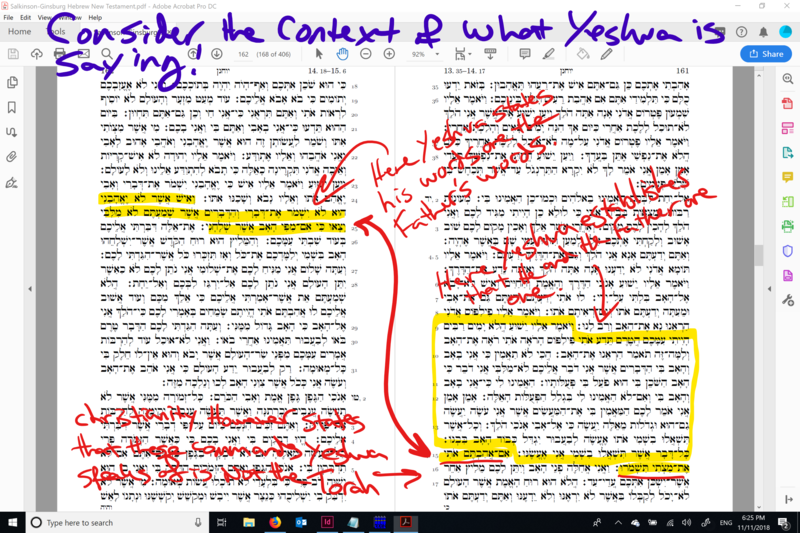 The rabbinic commentaries point out how the translators have a certain interpretation or presupposition based upon the way in which they translate the text. We also find something very similar in our English bibles where the translators inject their presupposition and philosophical beliefs, their doctrines into the translation of the text. If we are not aware of the underlying presuppositions, it is possible to develop doctrines that run contrary to what God would have us know about His Word. In other words, without being aware of these things, it is entirely possible to obtain an understanding that is contrary to what was intended. One such example may be found in Romans 10. In our English translations, Paul says “For Christ is the end of the law for righteousness.” τέλος γὰρ νόμου Χριστὸς εἰς δικαιοσύνην (telos gar nomou christos eis dikaiosunen). The word “télos” is a neuter noun and translates to mean “the principle end, end-goal, aim, or purpose” in the sense of “reaching the end (aim).” What Paul is trying to say is the Torah is the principle end, the aim, the end-goal that directs us to understand Yeshua the Messiah is our righteousness. The point is we are unable to reach the goal on our own (we fall short of God’s Torah). We are expected to live both holy and righteous lives. For example, the Holy Spirit convicts us of sin validating (establishing) the requirements of the Law in our lives (Romans 3:31). We then seek the Lord by the power of His Holy Spirit to enable us to produce the fruits of righteousness and faith. This is what it means when James wrote of faith and works (see James 2:24). These things are connected to walking in the Spirit which means we do not sin. The definition of sin is to disobey God’s commands. Essentially, the power of God’s Holy Spirit in our lives is to live for the Lord God Almighty according to His Torah. This is how the Torah and the Gospel Message are connected. We find something very similar in the classical interpretation from John 14. Notice how Yeshua goes to great lengths to establish that He and the Father are one, and that He is doing everything the Father tells him to do. This is connected to John 14:15 which states, “If you love Me, you will keep My commandments.” The typical interpretation on this verse states that this is not the Torah, but those things Yeshua commanded while he was teaching his disciples with the idea that Yeshua gave different commands than what are found in the Torah. In this case, the translation does not follow the interpretation. Based upon the text, Yeshua’s words are the Fathers words (John 14:10-11), His commands are the Fathers commands, the Torah. What we observe in the typical interpretation on John 14:15 is that it is entirely possible to do a verse-by-verse study of the Scriptures and miss something very important. In all cases of biblical studies, we must take a step back and look at the greater context. If we do not do this, it is possible to miss what Yeshua is teaching us. What we see here in the book of John chapter 14, Yeshua goes to a great extent to explain that He is in the Father and the Father is in Him (John 14:20). Also that His words, and the works that He does are actually the Father speaking and working in Him. (i.e. John 8:28, “I do nothing of my own initiative.”) Notice how Yeshua says he does everything the Father tells him to do. I don’t think anyone contests the idea that this is the Torah in the sense that Yeshua is obeying God’s Torah and is keeping His commandments. It is interesting however how Yeshua also at one point tells us to walk in his footsteps while Christianity interprets these Scriptures to say that Yeshua commanded something different than what our Father had given us in His Torah. Why do you think the church is so anti-Torah? (Study 1 Peter 2:21 He left you an example so that you could follow in his footsteps. 1 John 2:6 Whoever claims to abide in Him must walk as Jesus walked.) In the introduction to this Torah series, we looked at the how and why looking at the history of the church. What we find in this week’s Torah portion is the call of God on His people to go to the house of God (Bethel). Bereshit / Genesis 35:1 Then God said to Jacob, ‘Arise, go up to Bethel and live there, and make an altar there to God, who appeared to you when you fled from your brother Esau.’ 35:2 So Jacob said to his household and to all who were with him, ‘Put away the foreign gods which are among you, and purify yourselves and change your garments; (NASB, א וַיֹּאמֶר אֱלֹהִים אֶל-יַעֲקֹב קוּם עֲלֵה בֵית-אֵל וְשֶׁב-שָׁם וַעֲשֵֹה-שָׁם מִזְבֵּחַ לָאֵל הַנִּרְאֶה אֵלֶיךָ בְּבָרְחֲךָ מִפְּנֵי עֵשָֹו אָחִיךָ: ב וַיֹּאמֶר יַעֲקֹב אֶל-בֵּיתוֹ וְאֶל כָּל-אֲשֶׁר עִמּוֹ הָסִרוּ אֶת-אֱלֹהֵי הַנֵּכָר אֲשֶׁר בְּתֹכֲכֶם וְהִטַּהֲרוּ וְהַחֲלִיפוּ שִֹמְלֹתֵיכֶם:) Jacob understands this command as including the need to remove the foreign gods, the idols we have set up, to reform our ways, and to walk in God’s ways. This is coupled to the idea of arriving at Bethel and making an altar to God in the sense that we are to worship Him only in the manner in which He prescribed. These things are connected to the concept of “those things which we hold on to and refuse to let go; those things that hinder our serving the Lord.” This process of forsaking foreign gods is considered an “involuntary abandonment” by their owners which disqualified them from further use as idols, (Talmud Bavli Avodah Zarah 52); Yaakov “commanded” (his command is described as being “involuntary” for his household in the Talmud) the members of his household to remove these former idols and to sanctify themselves in order for the people to be qualified to serve God. The verse teaches us that sin itself is called ritual impurity. We have a similar verse in Ezekiel 20:7 where the prophet warns his compatriots ובגלולי מצרים אל תטמאו, “and do not defile yourselves by committing the kind of sins committed by the Egyptians.” On the other hand, anyone who abandons sin is described as ritually pure, as we know from Vayikra / Leviticus 16:30 מכל חטאתיכם לפני ה’ תטהרו, “you will become cleansed (ritually pure) from all your sins against God.” (Rabbeinu Bahya on Bereshit / Genesis 35:2 Part 2) In the mind of Yeshua, his disciples, and Paul, the Hebrew bible taught God’s love for all people and provided a practical guide for daily life. In the translation of the Hebrew and Greek texts, philosophical and theological beliefs are injected by the translators that show an anti-Torah opinion. 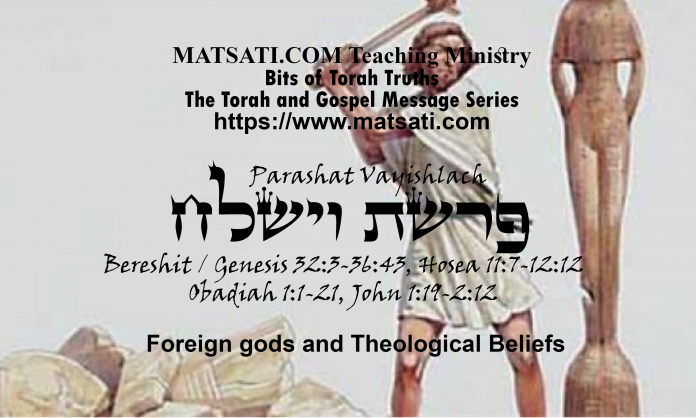 In light of Yeshua’s esteem for Torah, Matthew 5:17 is actually addressing the issue of properly comprehending the driving force behind the biblical text, which leads to right conduct before God and others. The Hebraic background, such as the approach we just took looking at the rabbis, clarifies the deeper meaning of the biblical text. Take for example, in the Rabbinic literature, the greek words from the gospel that are translated “Abolish” and “Fulfill” possess dynamic equivalents. The word abolish means “interpret incorrectly” and the word fulfill means to “interpret correctly.” The Greek word katalyo (καταλύω) means abolish, and its Hebrew equivalent is batel (בתל), which also means “cancel, abolish, destroy.” Often batel is used in contexts that deal with interpreting Scripture. A person cancels the Torah when it is misunderstood. This is what was happening in the story of Joseph and his people, they poorly understood thinking idolatry was OK and so he commanded them to put away their idols, to literally forsake them for they were going to the house of God to worship. The word fulfill refers to interpreting the Scriptures accurately. The Hebrew equivalent of the Greek word pleroo (pleroo) is kiyem (קיום). The root of kiyem means “to establish,” or “cause to stand” and has the sense of “upholding,” “observing,” “fulfilling,” or “to place on a firmer footing.” This word also is used in the rabbinic literature to refer to interpreting Scripture. The question is how can one obey the Lord according to His word if one does not comprehend what it requires? If one does not properly understand the role or place of the Torah in the Gospel Message, one may not obey the Lord’s will and therefore will cancel the law. Hence, a person may abolish Torah by misconstruing the divine revelation. This is what appears to be happening in the doctrines and theologies of this present day. And historically we are able to observe, the theological polemics within Christianity during its struggle for self-definition causing the church to sever itself almost completely from Judaism. What we are learning however is the Torah and the Gospel Message go hand-in-hand with one another. It is by the power of God and His Spirit which dwells within that enables us to walk according to the Spirit and live our lives according to God’s Torah! Remember, living the Torah of God is a by-product of having a relationship with our Father in heaven in Yeshua God’s Messiah! Previous articleWhat are the consequences of not having a Biblical World View?